Dais Global markets products for safe and environmentally friendly handling of aggressive fluids for the chemical and petrochemical industries. Dry Disconnect Couplings are available in sizes from ¾” up to 6” and in a wide range of materials and seals to be the given choice for almost any application. DDCouplings®, Dry Disconnect Couplings, are designed for quick and spill free connection and disconnection of hoses and pipelines. They are used by producers of ink, adhesives, fatty acids, pharmaceuticals, liquid soaps, petroleum, chemicals, agricultural and a wide variety of caustic products and speciality acids. Dry Disconnect Couplings can be found in a lot of various applications such as handling toxic chemicals, fuels etc. 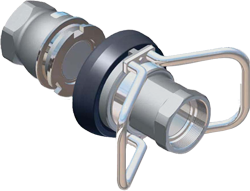 to transferring clean water, due to the wide range of materials, connections and sealing types Dry Disconnect Couplings are flexible enough to suit almost any application. DDCouplings® are in use in installations all over the world, especially where certification is a prerequisite and are certified by TÜV, Apragaz, Veritas, TDT, plus regionally required approvals. 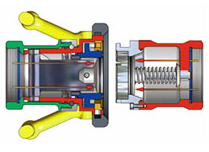 The Dry Aviation Couplings include a bayonet-type connector and are flanged or threaded to suit installation requirements. Each tank unit contains a “fail safe” springloaded valve seating on a tapered seat. 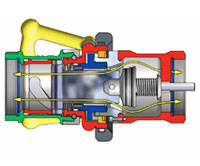 The valve is controlled by the action of coupling and uncoupling the hose unit. When connecting the DDCoupling the hose unit will slide easily over the tank unit. The three rollers engage in the three slots. To allow the hose unit to lock, rotate the hose unit clockwise approximately 100° whilst gently pushing towards the tank unit. To stop the flow and unlock the units, reverse the procedure.